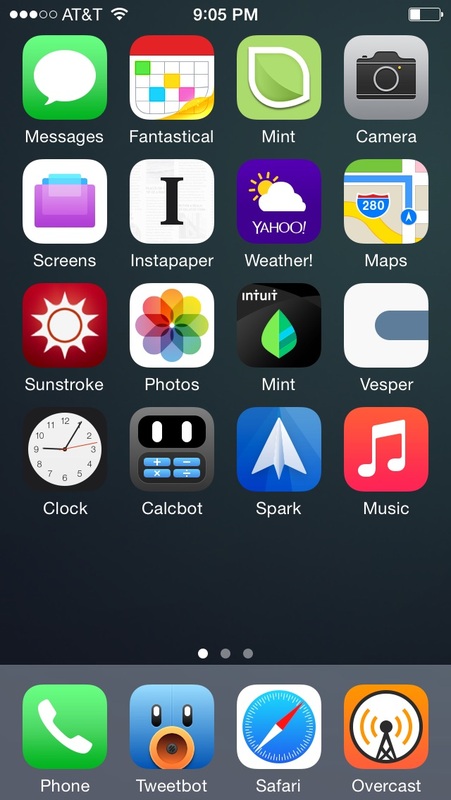 A recent piece by Graham Spencer at MacStories reminded me of how little my iPhone’s home screen has changed in the nearly eight years I’ve been using iOS. Messages, Camera, Phone, and Safari are still in the same location they were in when Apple first released the iPhone to the world on June 29, 2007. And many of the other apps are simply replacements for Apple’s defaults and still live in the same location as the app they replace. I regularly try alternatives to the applications I’ve designated as my default for a given task. Right now, I’m giving Readle’s Spark a go after using Dispatch as my go-to email client for over a year. So far it works just as it claims, but I’ll probably end up switching back to Dispatch after a week or two. Spark is great, but I’m not too keen on its user interface design — it’s a bit too busy — and I’m partial to Dispatch’s stark-white inbox with minimal buttons. I’ve also found that I don’t use enough of Spark’s more powerful features to make their existence feel warranted. Its a good app, its just not for me. I like to tinker with my gadgets and frequently test new software on iOS and OS X, but I think it’s important to point out that Apple did a tremendous job when they decided the order in which applications were placed on the home screen. 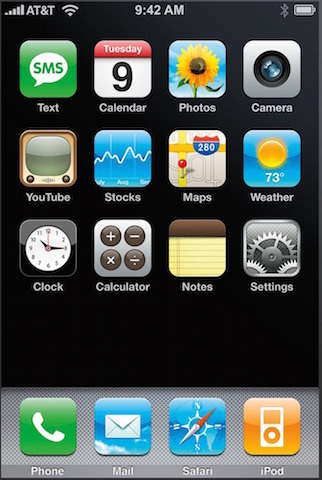 Here’s a picture of the original iPhone home screen, a screenshot of my iPhone from nearly five years ago (which you can also see on Homescreen.me), and a screenshot I took yesterday. When I finally moved from a 3.5-inch iPhone to a 4-inch model two years ago, I had a simple strategy when it came to adding the four icons to fill out my home screen. When compared to the above screenshot from five years ago, I shifted the following apps down a single slot: my RSS reader, notes app, calculator app, and email client (which has since swapped places with my Twitter app). I did this because I didn’t want to lose the familiarity I had ingrained in my thumbs over the previous five years of owning the iPhone. I can quickly jump into my calendar app, camera app, or podcast client because their locations haven’t changed for the entire time I’ve owned an iPhone. Aside from the addition of four more apps on my home screen, I’ve only moved three apps’ locations — I swapped Twitter and email, removed Settings, and demoted Music from the dock when Apple broke podcasting out into a separate application. I guess you could technically call that four changes. But since I most often used the iPod app to play podcasts, I’m going to count Overcast in the “replacement app” category. I continue to try out new applications regularly, and sometimes a new app takes over while I retire another. But, it’s almost unheard of for me to add an app to my home screen that doesn’t replace the functionality of a previous tenant. Apple did that good of a job when they curated the iPhone’s initial slate of applications. Over the years I’ve switched from the built-in weather app, to Simplenote, and eventually settled on Vesper. But all of those applications hold the same set of responsibilities and all of them have lived in the same slot on my home screen for years. Just as so many other apps have throughout my time with iOS. New entrants on my home screen are far more likely to replace a previous app’s functionality than they are to add a new category to my home screen. And, I’ve noticed this several times in the past given that my home screen has remained mostly unchanged over the years. But, I hadn’t ever made the decision to actually track these changes (or lack there of) by taking screenshots on a regular basis. I know Shawn Blanc is someone who always takes a screenshot of his home screen at the beginning of the month so he can reflect on its changes over time. I’d like to do something similar. 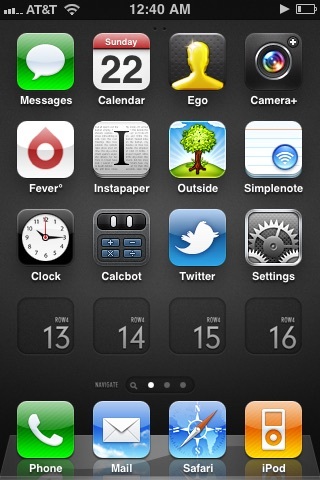 From this point forward, I plan to take a screenshot of my iPhone’s home screen on the fifteenth of every month. The screenshot will be published on the Initial Charge Twitter account — which I encourage you to follow. After I’ve accumulated a year’s worth of images I’ll share them here on Initial Charge alongside some notes about any changes that occur. I hope this process will give me an even better grasp on the evolution my home screen experiences over time, no matter how slow it may be.